The KFC Double Down goes on sale today for lunch. From all the hype, you'd think that it was available weeks ago. Behind the many indignant reviews is a marketing plan that is not quite new, but still genius. Once you strip away the plan, there's not a whole lot left. 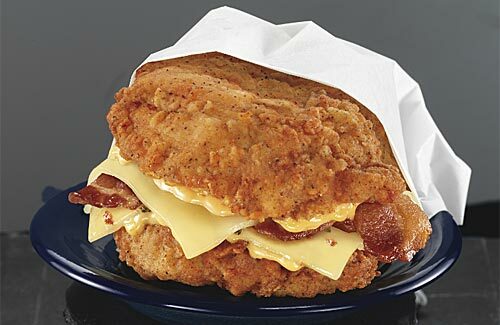 The Double Down is two chicken breasts with bacon and cheese between them. KFC is marketing this entree as a "sandwich", which is stretching the definition of sandwich past the limit. A sandwich is defined by the bread, whether its baked bread, tortilla, pita, or whatever, which allows you to eat the thing with your hands. The Double Down is served in a paper envelope, because you really can't eat it with your hands. The only bread involved is the fried breading on the chicken. KFC managed to garner a whole slew of product reviews from news outlets and bloggers who have never tried it. The company is riding the wave of indignation over the US's horrible eating habits that gives us sites like This is Why You're Fat, which highlighted the Double Down a while back. The Huffington Post, Treehugger, Consumerist, Boing Boing, and other blogs jumped on the bandwagon about the Double Down's April 12th debut. And that's after some of them expressed their outrage last August when KFC first announced their plans for it. You see, the Double Down contains 540 calories, 32 grams of fat, and 1380 milligrams of sodium. Of course, you can get the grilled version and lower that to 460 calories, and 23 grams of fat, but the sodium goes up to 1430 milligrams. If it didn't have salt, it wouldn't be KFC. Yes, that's the way we do fried chicken in Kentucky, maybe not as much as the Colonel did, but fried chicken is salty and has been for a couple hundred years. What the world doesn't realize is that we served fried chicken for Sunday dinner only and ate beans and cornbread the rest of the week. At least, we did until we became addicted to fast food and Mountain Dew. Then there's the allure of bacon and all it represents. You've seen it right here at YBNBY, when someone puts bacon in a recipe, it will be blogged. There are too many sites dedicated to bacon for the Double Down to be ignored. However, there are only two slices of bacon on the Double Down, not enough for adoration or excitement. And the cheese is there to glue the two pieces of chicken together. Buy a Double Down, if you want. Take it home. Slice it in two pieces. Put them on two plates, add a small salad and a thick slice of French bread. Serve it to yourself and someone you like for dinner (with wine). Look! 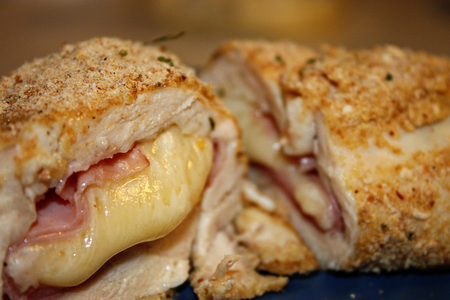 Chicken Cordon Bleu! But it if it were marketed THAT way, would there be all this publicity? I don't think so. I'll bet that it is disgustingly delicious. said Ben Lurkin on April 13, 2010 1:44 PM. I saw the commercial for it yesterday. I honestly thought it was a belated April Fools joke. said heather.epp on April 13, 2010 4:49 PM.